Salvation And Survival: Should We Be Building A Wall? Should We Be Building A Wall? I ask this question in light of some of the news I am seeing in the world. 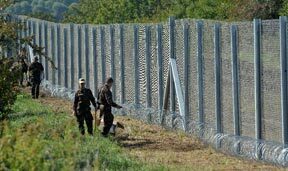 For instance, the government of Hungary took extreme measures to protect the sovereignty of their country after experiencing up to 10,000 people stream across its borders daily since the summer influx of migrants escaping the mayhem of the Middle East. After constructing a razor-wire fence early Saturday, barely a month after it shut its frontier with Serbia, only 41 people crossed into Hungary this past Sunday. So it would seem that erecting some kind of barrier has worked for this EU member state. Then there is also the news that Israeli police have begun erecting a wall in East Jerusalem to protect a Jewish neighborhood that has been subject to firebomb and stone attacks launched from an adjacent Palestinian village. Of course, if you read my blog yesterday, it should not surprise you that critics of this move see it as a division of the capital of Israel. But if it is effective in reducing the number of attacks on innocent civilians, is it justifiable? That is the same question that the citizens of this nation are asking. We can no longer ignore the warnings of ISIS that they are coming to destroy us, and we all know that the number of illegal immigrants flooding across our borders is unsustainable. But how do you stop the perils that threaten to harm the very existence of our country? Isn't a fence or wall at least a feasible solution? I mean, don't airports have fences around them to keep out those who seek to cause harm? Most concerts I attended in my youth had fences to keep those out who tried to sneak in without paying. And even the White House has a fence around it.... so why is it labeled such an intolerant idea to consider that we protect our nation from those who could actually, or potentially, destroy our way of life? And I'm sure it won't surprise you that I take a Biblical look at the notion of walls. What does God think of walls? We read lots of verses about physical walls in the Bible... the walls of Jericho; the walls of the Temple; and the walls that Nehemiah would construct to rebuild the city of Jerusalem... just to name a few. But these walls also had great spiritual significance. Remember that Satan accused God of putting a hedge of protection around Job so that he (Satan) could not accuse him. In Hebrew, that word "hedge" meant to shut in for protection or restraint; a fence. It was a spiritual "hedge" or fence that surrounded Job. Remember, also, that God placed cherubim with flaming swords at the entrance to the Garden of Eden to guard the way to the tree of life. They were, in essence, a wall that could not be breached. And, finally, we see in the last book of the Bible, Revelation, that there will be a massive and high wall surrounding the holy (sanctified) city of Jerusalem, coming down out of heaven from God, and having God’s glory [filled with His radiant light]. In fact, there are seven very detailed verses in Chapter 21 that describe these very walls of the New Jerusalem. Walls obviously mean something to God! So what should that tell us about our own considerations of a protective wall around this nation? 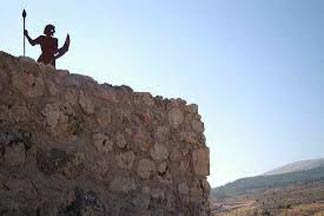 I can tell you one thing --- Satan hates walls because God has used walls to protect what is valuable to Him. Shouldn't we be doing the same? I recently ran across a Bible study that covered this very topic, and it asked some very pointed questions that I think lend weight to our discussion.... Do we have a wall to keep the enemies of God's way out of our lives and homes? Have we set boundaries against the world, or have we torn down the wall? If we have a wall, are we leaving the gates open and unguarded? Are we willing to fight to defend our families and our church? Or do we just let the enemy stream in unchallenged? Notice that all these questions have both a physical and spiritual aspect. We can apply these queries to our human enemies and social problems, as well as to our spiritual foes. Remembering that Satan hates for us to put up walls, and that God puts a wall around His people to keep Satan at bay, (as in the example of Job), I think it is essential that we have a thorough conversation on constructing our walls. The Bible says in Ecclesiastes 10:8: "He who digs a pit [for others] may fall into it, and a serpent may bite him who breaks through a [stone] wall." Now, that can be interpreted a couple of ways: first the aggressor that breaks through the wall God has erected to protect His people can expect to be bitten by the serpent, which God will allow. It can also mean that those who let their spiritual wall crumble will have opened up an entrance for Satan to strike. Either way, the protection of the wall is gone. The final point I want to make is this: God is our ultimate wall; our protection. But that protection hinges on us maintaining a sanctified relationship with Him. It is within His rights and character, as Creator, to tear down our walls because of our sins. And He is under no obligation to honor or rebuild the wall He offered us, especially if we reject Him. The surest way to restore the wall is through sincere and complete repentance, both as individuals and as a nation. So, while I am intrigued that Hungary and Israel have built new walls and fences to protect themselves from the enemy storming the gates, I have to wonder about the soundness of their spiritual walls. And I must admit that I have little confidence that America will ever build a wall to protect itself --- either physically or spiritually. And should Congress somehow appropriate the money to begin construction of such a wall, if God is not in the building of it, it will crumble at the smallest strike by the Enemy. Until we get serious about restoring the foundations of the protective hedge God once applied to this nation, the physical wall we propose to build will collapse because of its inherent weakness and the lack of solid spiritual material. Ezekiel 13:10-11: "... because when one builds a [flimsy] wall, behold, these [lying] prophets plaster it over with whitewash; so tell those who plaster it with whitewash, that it will fall! A flooding rain [of judgment] will come, and you, O [great] hailstones, will fall; and a violent wind will tear the wall apart." The Almighty is our ultimate protection for sure. There are several Psalms that proclaim this. One is Psalm 18 which starts by saying, I will love thee, O Lord, my strength. That is the ultimate wall! That is one of my favorite scriptures! And it is the one I recite out loud as my sword when doing spiritual battle. And, yes, He is our wall, our fortress, our shield, and our stronghold! What is the Bible study you are referring to? You have been talking a lot about spiritual warfare lately, and I would love to know some of the resources you have used and could recommend. My family is under terrible attack right now. Really bad. I have studied spiritual warfare some in the past, but we are under such an onslaught right now, that this is my most important focus. The Lord told me this week that the things I have done in the past, will NOT be sufficient in the future. Just like my husband and I are finding out that when we were younger, we could get away with not taking better care of ourselves physically, it is the same way in our spiritual lives. The things we relied upon in the past, and the "status quo", wasn't going to work anymore. We need a new plan and new training so we can stand up to this major attack against us. So, any materials/authors/books/studies you could pass on would be most appreciated. Also, if you would like to email me at my private email address (belle@salvationandsurvival.com) and give me a little more information on how you are specifically being attacked, I may be able to refer you to more targeted material and/or offer some Biblical advice. Please feel free to contact me and I want to help any way I can in seeing your family delivered from your oppression. God Bless You! All you need to follow is Eph 6 - the church has run wild with senseless binding and loosing that has been mostly built on the doctrine of men. If you want to shop the attacks....shut out all sources of negativity. Shut off the TV, stop inviting strife into your home. Do what God does - tell satan he's not allowed into your lives, kick him out, and spend time in praise - satan can't stand praise and FLEES from it. Decide to live a life of praise - the Word says it "has the power to still the enemy". If your praise life stinks and you've go the TV/TIVO/DVR/Roku/Prime importing crap, that's why you're getting attacked. Satan cannot steal from you what you haven't offered up, so walk the walk and live holy. He can only steal from you when you've opened the doors, and if you haven't opened the doors, you stand on scripture that tells you if you've caught a THIEF, he must repay up to seven times the value of what he stole. You also need to watch your language - by what you're saying, you're rendering yourself powerless. "My family is under terrible attack right now"; you've cursed yourself, and you've determined the severity of the attack. You really do need to learn to speak LIFE, not death over your family and the situations in your life. Scripture says that you have all the power OVER the power of the enemy - you have MORE POWER over satan than HE has over you, but you're choosing to be on the bottom of the pig pile. Check out a book called "Hung by the Tongue" and "Take it, it's Yours!" After your language, you need to learn YOU were always destined to have dominion, you're not a slave, you're not begging for crumbs that fall from the Master's table. You are a child of The Most High, and you're supposed to sit at the table, but you're letting satan tell you you're Lazarus and lucky the dogs are licking your sores. Stand up and start SWINGING at the enemy!! Satan is a LITTLE imp, he's not this big, scary monster that the movies portray him as. He's nothing more than a kid going through the "terrible twos", and if you keep giving him power and seeing him AS powerful, he's going to continue to roll you because you're letting him. Stand up and STOMP his miserable behind! !